DE JONG Hoists (Aus) offers a complete range of rack and pinion driven construction hoists, industrial elevators, and warehouse elevators which are being used on construction sites, mine sites, ports, and in warehouses. Our machines are known worldwide for their operational reliability, ease of use, and minimal maintenance costs. All of our equipment meet the highest safety requirements. We have the solutions you need whether your business is in the construction, mining, oil, gas, or any other industry. An additional advantage is that our machines are also very competitively priced. The Dutch quality engineered and under ISO 9001 manufactured machines make their investment worthwhile. We keep a full range of machines and spares in stock for sales or hire and can make modifications if required in our professionally equipped workshop. For customers on a budget, we also carry a wide range of used machines at very attractive prices. You get the same high level of quality, reliability, and safety, but at much lower costs. We also fully service and inspect all products, new or used. Our team of factory trained and certified technicians are also ready to give you all the support required. If you are looking for a reliable partner to supply materials like a rack and pinion hoist or other industrial and warehouse elevator needs, we have you covered. 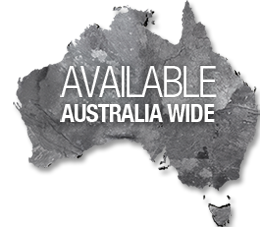 DE JONG (Aus) is here for the long term and can help your business grow. Our motivated team of specialists will be more than happy to work together with you and give you the best advice possible. Call us today for more information about our products and services. We look forward to helping you fulfil all requirements for your current or next project. These reliable rack and pinion hoist machines were manufactured with the needs of a construction crew in mind. All of our construction hoists are fully hot dipped galvanized, which provides added durability and toughness. Every part of these machines is designed to be in compliance with all of the Australian standards. 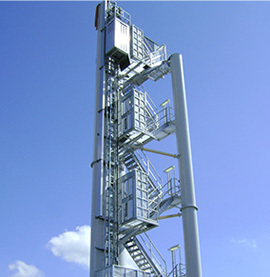 We carry a wide range of products for transporting materials and people to whatever heights you require. 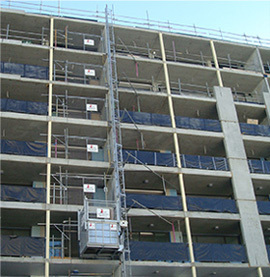 Our materials hoists are perfect when you just need to transport materials on a construction site. They can carry anywhere from 300 to 2000 kg and many of our models include an enclosed cage. If you need to move people along with materials, then take a look at our man and materials hoists. These reliable machines vary from 1500 to 2000 kg. One of the primary benefits of these hoists is that they lead to faster construction times and lower costs. They reduce the need for a tower crane, which can be expensive and even lead to excess downtime. Safety is a major concern for us. That’s why our machines have a high quality rack and pinion drive system, as well as an independent brake system for additional safety. For your convenience the parts are interchangeable between several models of our construction hoists. This ensures that you will always be in business with a DE JONG (Aus) machine. These hoists are manufactured for the toughest environments such as harbour cranes, mines, chimneys, oil rigs, and much more. The special design can hold up against high levels of heat, humidity, wind and dust. If you need explosion proof extensions, we also have an ATEX option. These industrial strength machines are basically a permanent elevator for lifting goods and people. We only use the highest quality materials and parts, as well as build each machine for your industrial site and projects. This tailor made approach ensures that our hoists satisfy all of your unique needs. Our philosophy is that every problem, no matter how difficult, has a solution. For installations, we have a team of highly trained and qualified technicians. They can work side-by-side with your team to supervise the installation of an industrial elevator. We can also complete a full installation of these machines on your site. In case you ever have any maintenance issues, we keep our warehouse stocked with a large selection of spare parts. We understand that downtime is costly for you business, which is why we take these extra measures to get you back up and running in short order. Hoists for warehouses have a unique set of requirements. They do not usually need to handle tough outdoor environments, but it’s crucial that they are fully functional, reliable, and safe. That’s why our hoists are specifically designed with these needs in mind. We do not waste any of your money by including nonessentials. Instead, we focus 100% on building an elevator that is perfectly suited for a warehouse environment. This means that they are simple to operate and do not require the use of a high risk license to run. The loading ramps and landing doors are controlled electronically and come with mechanical locking systems for additional safety. Also, if the loading platform is not at the required landing, the doors cannot be opened. We use a vertical closure on the ramps to ensure that the load is completely secured on the platform. 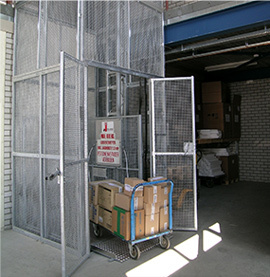 Warehouse elevators are permanently installed in one area and only move vertically, which reduces the risk of accidents. Depending on your needs, you might not need a brand new machine. We carry a large selection of used equipment that changes on almost a daily basis. These machines are still reliable and offer a high degree of safety, but can be purchased at lower prices. If you are in the market for a dependable hoist or elevator, contact one of our friendly representatives today for more details.